Partnerships – The Room xChange – Come on board. The sharing economy is being taken to an exciting new level, connecting people who want more out of life with the resources that already exist. The Room Xchange is tackling the challenges head on of the housing crisis across the major capital cities across Australia and the world, the stress that households are facing, as well as the high costs of living that Millennials have inherited which they are just unable to afford. We’re on the lookout for businesses who are passionate about positively changing the way people live and how they connect socially to join us. 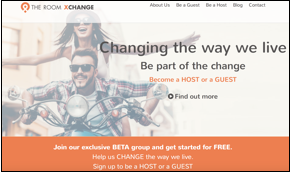 We are an online marketplace that connects busy people who have a spare room, with guests who are willing to give a couple of hours around the house each day in Xchange for food and accommodation. Find out how you can join us by becoming one of our valued partners. Hi, I’m your host Annemarie Cross. Joining me today is the CEO and Founder of The Room Xchange – Ludwina Dautovic to tell us more about the Xchange Partner Program. Last Minute Billboards – Melbourne based outdoor advertising campaign throughout 2017. AWN (Australian Women's Network) with a database of 660k+ businesswomen. Calling out to Hosts and partners. Travello – targeting the travellers who are coming to Australia to experience cost-effective living and a true local experience. CVCheck – access to their vast network of partners and events. Ludwina Dautovic has been a successful entrepreneur for over two decades and is the Founder and CEO of The Room Xchange, a service which connects busy professionals, young families and empty nesters with a spare room in their home (hosts) with travellers and guests who provide an agreed amount of help around the home in exchange for food and accommodation. Commissioned by Apple and Optus to create an educational media program signalled the birth of her first company, Media Minds. For the next five years, Ludwina and her team ran two-day media workshops in over 300 schools in Adelaide, Brisbane and Melbourne. Ludwina then combined technological expertise with business acumen to provide consulting services to businesses operating in the online space. Today, Ludwina is an investor in new and emerging technologies and has invested in four tech start ups, The Room Xchange, her fifth tech investment, is so far, fully self-funded. With the full support of her commercial partners and strategic advisors, (Chris Adams, Tim Wall, Erik Tyler and David Stavropoulos) Ludwina is immersed in her first capital raise and leading the company towards a global market. Ludwina was recently included in the 100 Leaders Program as part of the world’s first interactive leadership forum created by Xventure. Organisations across the world are able to see and hear from Ludwina as part of this global initiative. Ludwina is regularly called upon as a commentator in media outlets including CMO, Sky News, Who’s Who of Australian Women, The Age, The Herald Sun, CEO Magazine and more.